0 Comments Published by Cedric Benetti on Friday, August 29, 2008 at 8/29/2008 03:30:00 PM. Politics and fashion seem to go hand in hand once again, otherwise Obama wouldn't ask for that much CHANEL for the American people. 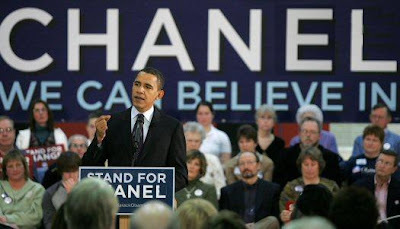 It all started with Barack Obama's "CHANEL we can believe in." Hillary Clinton then picked up the theme with "CHANEL you can count on." Even John McCain, who's been in Congress for more than quarter a century, is promising, "CHANEL is coming." It's clear Americans are looking for CHANEL in this election - or at least the candidates think that's where the voters are.